Sue beats my manuscripts into shape, making sure they make sense gramatically and in terms of the story. You’ve probably noticed that she doesn’t do that for my blog posts. 🙂 She manages to pull me up on mistakes, missing information and other problems, and she does it in a way that never feels like criticism. Sue also ensures my head doesn’t get too big to fit through the door and nails my feet to the floor when I’m getting too carried away, whilst giving me amazing levels of support the rest of the time. Basically, she’s amazing and I’m constantly grateful for having her in my life. Sue does an amazing job of editing, but that still leaves plenty of work for a proof reader. Editing and proof reading require different approaches (as far as I can tell, I’ve never done either!) and Frank has done a brilliant job as proof reader. Like Sue, he’s able to point out issues, mistakes and in particular repeating problems in a way that prickly-writer-me doesn’t take offence at. Frank also proof read the first three Wanderer books, though I’ve only managed to update the first so far. I have to point out that for Kindle and possibly the other venues it’s really hard to force a new version out to people who already buy doxycycline over the counter uk have it, so if you have a version with grammar or other issues it’s not a reflection of Frank’s abilities at all! Anyone who’s got their copy in the last 6 weeks or so should have the proof read version. Even after a manuscript has been through editing and proof reading issues can slip through. Even worse, when fixing some issues I can introduce new ones that no one will have had a chance to catch. That’s one reason why the beta readers are such an important part of the process. The other reason is that it’s a chance for a reasonable number of people to read the book and let me have their thoughts – and in particular whether there’s anything wrong with the story. (I’ve included those that life threw a curve ball at and didn’t manage to finish, because they put themselves out there for me and I really appreciate it). I left it pretty late to ask for advanced reviewers, yet the response has amazed me. Thank you so much everyone, and I can’t wait to read your reviews. Last, but certainly not least, I have to thank everyone that has read one or more of my books. The fact so many people have read and loved my books gives me chills, and I’m sure that won’t ever change. 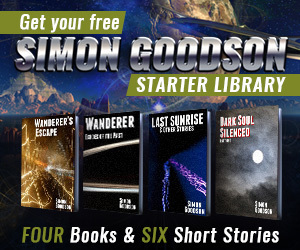 Knowing that over 120,000 people have downloaded Wanderer’s Escape alone, and that over ten thousand (and probably quite a lot more) have bought my books, is mind blowing. Add to that the hundreds of amazing reviews, kind messages and emails sent to me and, well, I’m lost for words. Thank you all. You’re amazing!